The Kennedy Creek Salmon Trail first opened in 2000 and since that time has provided a unique opportunity to watch spawning chum salmon in their natural habitat. The trail has 11 viewpoints and teaches visitors about salmon and environmental stewardship through a series of interpretive signs along the trail. 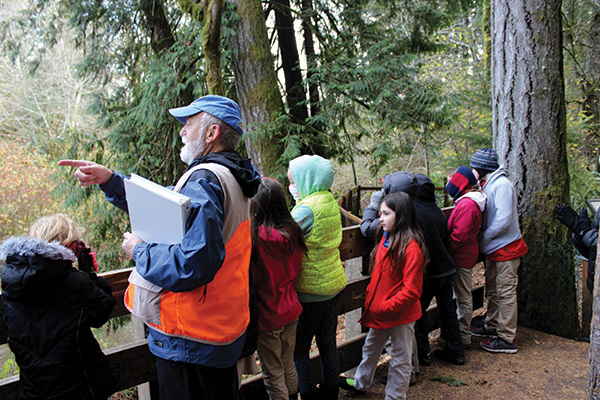 During the week, volunteer docents lead field trips for local students. On the weekends, the docents provide information and answer questions about the fish that spawn here every year. Nearly five thousand people visited the trail last year to learn more about the salmon life cycle and observe chum spawning and courting behaviors. The half-mile trail is almost entirely ADA accessible. The trail traverses riparian areas and pleasant second-growth lowland forest. The Kennedy Creek Salmon Trail was developed by South Puget Sound Salmon Enhancement Group and Taylor United Shellfish Company, with generous cooperation and assistance from many other entities through grants and donations. South Puget Sound Salmon Enhancement Group (SPSSEG) helps salmon from “The Mountains to the Sound.” We have all seven species of Pacific Salmon throughout our service area and aim to protect all of them through habitat improvement and construction projects.